The reincarnation of Nubchen Sangye Yeshe known as Tsasum Terdag Lingpa or Garwang Namchag Dorje was born in the eleventh rabjung, although the year of his birth is unclear. His father, Tashi, was from Drupchen Ling, and his mother, Gelekma, was from the area known as Ngarong, which is near the slopes of the secret mountains Jowo Zegyal and Kugyal Shan in the Ngachen region of Tibet. At the time of his birth, numerous amazing signs and visions appeared. When he was very young, he received refuge vows and teachings from Lama Karda Chöje, the head lama of the Karda Monastery of the Gelugpa School, who was known as the reincarnation of Ngog Loden Sherab. Upon receiving these vows, he received the name Tashi Phuntsok and entered the monastery, where he memorized some daily ritual ceremonies and sadhanas. At a very early age, he received a teaching from the great tertön Tagsham Terchen, who was visiting the town of Ngachen Gar, thus forging a dharma connection between them. No accounts of his life indicate that he contacted or received teachings from any other teachers at this time. Tsasum Lingpa’s behavior was so wild that it was very difficult for him to get along with the other monks. The monastery appointed him as the “collector of donations for the monastery,” and when Lama Karda Chöje went to central Tibet to make offerings, Tsasum Lingpa joined him as an attendant. This was during the time of the White Lotus Holder Yeshe Gyamtso and his dharma patron, King Lhazang. Young Tsasum Lingpa was so smart that Lama Chöje encouraged him to study philosophy, but since it had been predicted that he would reveal many profound and timely terma teachings, he did not stay for a long time in central Tibet, but instead returned to Kham. Subsequently he returned to central Tibet, where he contacted Könchog Thinley Zangpo of Drigung Monastery who became his root teacher. He stayed for about three years in that monastery and received many teachings, particularly the oral pith instruction lineage teachings of the Zabir wind practices , in a very thorough and detailed way. Immediately his realization and experience burst forth: omniscient wisdom and miraculous powers arose and developed effortlessly. By achieving complete realization of his wind energies and his mind, his miraculous powers enabled him to travel to many holy mountains very easily and without any delay, according to instructions and advice Yeshe Tsogyal. From the Dakini Assembly Hall of Zhoto Tidro, he received the Heart Practice of the Lama That Accomplishes All the Sugatas and Fulfills All Wishes. This was the first terma he revealed. In a dream, Tsasum Lingpa went to the Pure Land of Lotus Light and had many amazing and inconceivable experiences and visions. From then on, at the holy mountain cave of Chenrezig called Tsari Zilchen Phug, Mön Sha’ug Taggo, Kongne, and other places, he revealed many terma teachings. Because he knew that his root teacher, Könchog Thinley Zangpo, was thinking to benefit all other beings by entering mahaparinirvana, Tsasum Lingpa traveled to see him; but due to obstacles on the path, it took him longer than expected, and when he arrived, his lama had already passed away—it was the day of the cremation. This happened during the same period of time when the Zungar armies invaded central Tibet (around 1718). 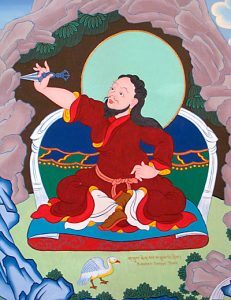 Tsasum Lingpa went back to Kham and opened the secret mountain door of Jowo Zegyal, the second Tsari. This was the first of many other secret doors in sacred mountains that he opened. Due to his auspicious connections with the king of Ngachen and other dharma patrons and disciples, his dharma activities were able to spread to some degree in that area of Tibet. In particular, he had very positive connections with the dharma patrons of Kanam Depa in the hidden valley of the Puwo area of Kham. There he founded a small monastery named Dudul Ngagpai Ling, in the valley of Trimzig Ngamchen at Puwo Yegong. On the eastern side of this mountain range, called the Gawalung Valley, he identified the holy site of Hayagriva; in the south, Jala Singdam, the holy site of Yamantaka; in the west, the mountain of Bongri, the holy site of the Dakini; and in the north, Ma Kunglung, the holy site of the Eight Herukas. From Ngamchen Rong, he revealed a large cycle of terma teachings of the Eight Herukas. He also revealed many other terma teachings in this area. He was able to transcribe and spread most of these teachings through empowerment, transmission, and pith instructions. Tsasum Lingpa recounted his life up to this point in his own autobiography, which is known as the Clear Garland Crystals of Fire. Written in verse and comprising more than three hundred loose pages in pecha form, it describes his visions, predictions, and songs, although it does not actually include many details about his daily life. It appears that no one contributed any additional information about his life beyond the time when his autobiography ends [when he was about thirty years old]. When he went to the Puwo region, he enthroned Daglha Gampo Zhabdrung as his lineage holder. This was apparently around the time of Zangpo Dorje Tulku. Tsasum Lingpa has many names: Pema Terdag Lingpa, Karma Ledril Lingpa, Rigdzin Tsasum Lingpa, Garwang Ngachok Dorje, Ngagchang Hungnag Dragtsal, Rigdzin Dudul Dorje, and Terchen Padma Mindrol. He made a list of his terma teachings while he was in the Puwo area, which include: “Four different long-life practices, the Dark Red Amulet of Yangdag and Phurba, three different practices on wrathful deities, practices on the ‘Great Compassionate One,’ Lion-Faced Dakini practices, two different practices on Shing Chong, practices on the five emanations of Mahakala, practices on the ‘Hundred Thousand Essences of the Mighty One, and many others. Altogether, the yellow-scroll termas that I revealed and transcribed up to the Fire Dog year  total a little over fourteen volumes.” This was said by Tsasum Lingpa himself. This is just a rough list; there are more [terma teachings] than those listed above. 1. These are terma teachings of the great tertön Drikung Rinchen Phutsok of the Drikung Kagyu lineage. 2. Rigdzin Thugchog Dorje, an emanation of Hungkara, one of the Eight Great Vidyadharas, was a great tertön who revealed many termas and was one of the principal teachers of Rigdzin Jigme Lingpa. As a lineage holder of Tsasum Lingpa, Rigdzin Thugchog Dorje edited his terma teachings and transmitted them to many students. 3. This refers to the Fire Dog year of 1726. 4. The complete text of this biography by the great First Khyentse can be found in The Dark Red Amulet: Oral Instructions on the Practice of Vajrakilaya (Snow Lion Publications, 2008) by the Ven. Khenpo Rinpoches. This brief biography of the great tertön Tsasum Lingpa was written by Jamyang Khyentse Pema Ösel Dongnag Lingpa in the middle of the nineteenth century. It was translated by Khenpo Tsewang Dongyal and Pema Dragpa in the Shantarakshita Library of the Sambhogakaya Temple at Padma Samye Ling, in the seventh month of the Fire Dog year, August 2006. May all be auspicious!